Rubey M. Hulen, the judge who signed off on the airport nuke-waste dump, later sentenced himself to death. On the morning of July 7, 1956, federal district Judge Rubey M. Hulen, had breakfast with his wife before a scheduled doctor’s appointment at Barnes Hospital in St. Louis. He never made it to the appointment. 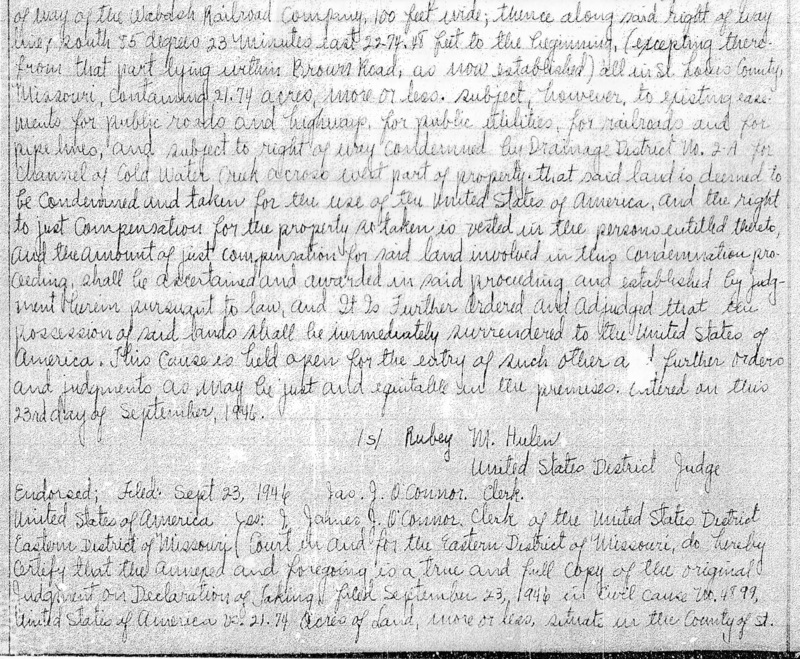 An excerpt of the 1946 Land deed for the St. Louis Airport Site that includes Judge Rubey Hulen’s signature. Instead, he was pronounced dead at the same hospital later that day. The family gardener found Hulen’s body at approximately 10 a.m. lying in the backyard at 16 Southmoor Drive in Clayton. 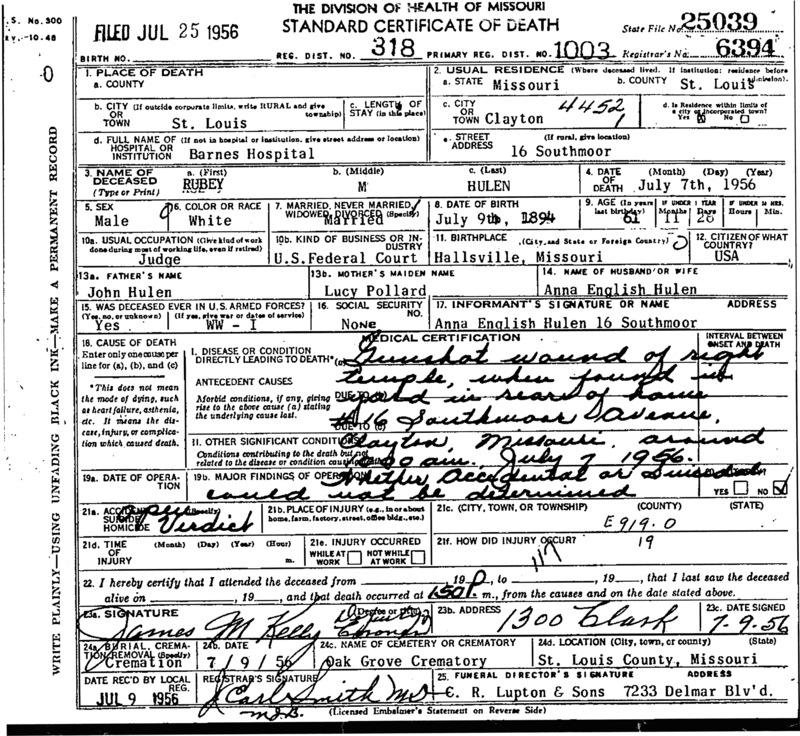 The death certificate indicates Hulen died of a gunshot wound to the right temple. A .32-caliber revolver was found next to his right hand. Nearly a decade earlier, on September 23, 1946, Hulen signed an order sanctioning the taking of 21-plus acres adjacent to the St. Louis airport. The acquisition by the U.S. War Department was carried out quietly on behalf of the top-secret Manhattan Engineering District, which purchased the land for $20,000 to store radioactive materials produced by Mallinckrodt Chemical Works of St. Louis. The materials were byproducts of uranium processing used to create the first atomic bombs and subsequent nuclear weapons work. For the next twelve years, open dump trucks loaded with radioactive residues continued to be shipped from Mallinckrodt’s plant on North Broadway to the airport location. As the piles grew, radioactive contamination migrated off site, draining into nearby Coldwater Creek, which flows through the sprawling suburban communities of North St. Louis County. The U.S. Army Corps of Engineers began cleaning up the creek in the late 1990s and the work continues today. At the time of his death, Judge Hulen, a Roosevelt appointee, was preparing to sentence two former Truman administration officials on corruption charges. That decision may have not been the only thing weighing on his mind. Two years earlier, he had overseen the extortion trial of five labor union officials, meting out stiff punishments to all of them, including a 12-year sentence to Lawrence Callanan, the boss of Steamfitters Local 562, a politically-active St. Louis-based union with ties to organized crime. At the sentencing, Hulen admonished Callanan for his lack of contrition. Hulen, a marksman and World War I vet, practiced shooting his handgun in the backyard of his Clayton mansion on a regular basis. Given the circumstances, the target practice may have been prompted by his need for self-defense. Though the press presumed the judge’s demise to be a suicide brought on by depression, the St. Louis coroner ruled the death an open verdict. Following the incident, the Clayton Police searched the backyard but reportedly failed to find either the bullet or the cartridge that had been fired. Among those who rushed to the hospital after the shooting was attorney Forrest Hemker, a family friend. Interestingly, the law firm of Greensfelder Hemker & Gale later represented the Catholic Church during its ownership of the radioactively-contaminated West Lake Landfill in the 1980s and early 1990s. The contamination at the landfill originally came from the airport by way of the interim storage site on Latty Avenue in Hazelwood.